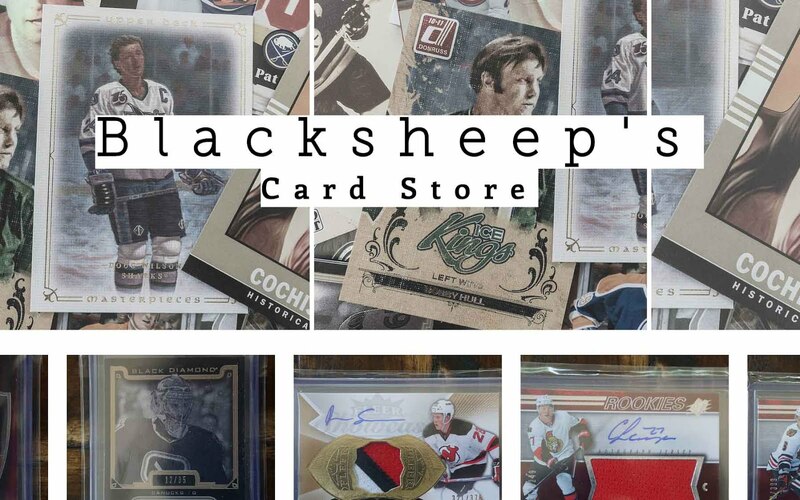 Upper Deck is getting close to finishing off the 15/16 hockey card season. Today they released one of their big boys - Ultimate Collection. 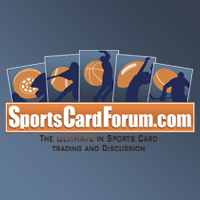 This brand is very pricey and is one of Upper Deck's most premium brands. Clocking in at about $250 per box, you have to have some deep pockets if you want to dig deep into this set of cards. The main set of Ultimate Collection is a little confusing as the cards contain jersey pieces and autographs. The cards may initially be thought of as inserts or parallels when pulled... but no, each veteran base card has a jersey piece embedded in it and is numbered to 199. Aside from the memorabilia, the base cards carry on the traditional look of Ultimate Collection. The brand logo is in all foil in the corner, and streaks of silver foil run across the card. The player is prominently featured within the design elements and photo background. The look of these cards are definitely high-end and will be appreciated by collectors who enjoy premium card stock and a refined look. The back of the base card has a zoomed-in version of the front photo and just a few bits of the player's bio. As you can see, the majority of the card is taken up by Upper Deck's message guaranteeing the jersey piece on the front is authentic. Premium high-end cards really don't put much emphasis on including player write-ups or stats, so I guess it's not that big of a deal. With these premium cards, everything that matters is really on the front - the serial numbering, the looks, memorabilia, auto, etc. Collectors aren't going to be using Ultimate Collection cards to gain knowledge on a player's career. Rookie cards from Ultimate Collection retain a similar feel to the way they have always been done in this set. The rookies have hard signed cards with varying serial numbering depending on what tier a rookie is in. Top tier guys like Connor McDavid have rookie cards limited to only 99. 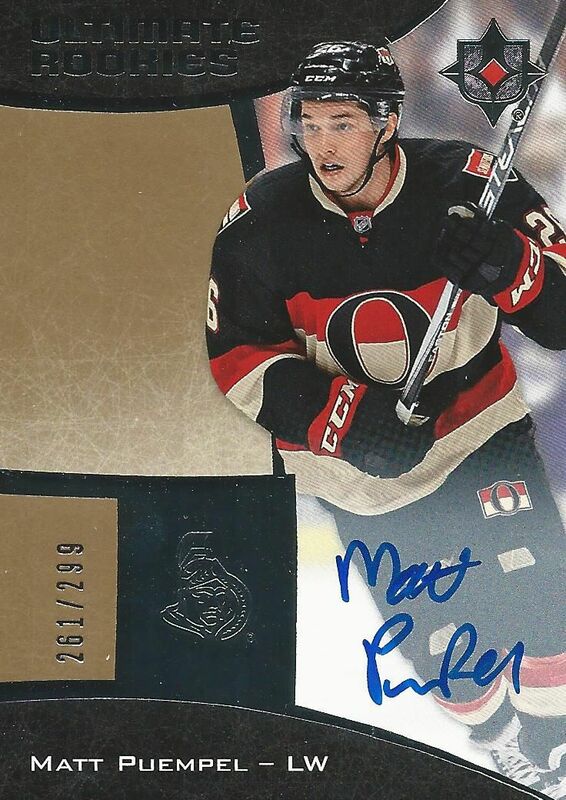 The common rookies like the Matt Puempel I pulled are serial numbered to 299. Ultimate Collection is all about the hits... even the base cards are hits! Aside from those, though, collectors can find many patch variations of cards as well as numerous cards that contain many different combinations of ink and cloth. Paralleling the base set are cards like the Jake Virtanen I pulled. This card has a large swatch of jersey along with an on-card autograph. There have been similar cards to this in past Ultimate Collection releases. Though this card looks pretty good for what it is, Upper Deck has even nicer versions of this card available. They go from having patches that fill the window all the way to NHL shields. 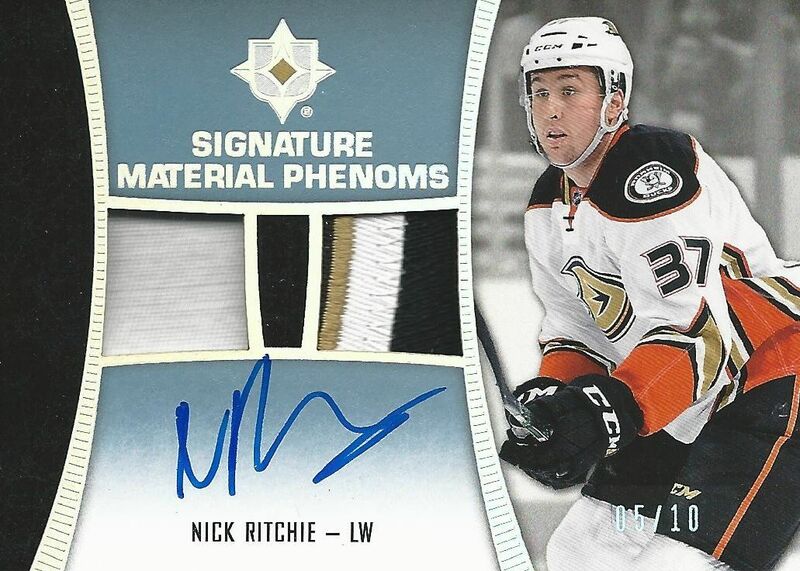 This Signature Material Phenoms Card of Nick Ritchie was the thickest card in the back. It has 2 patches in it and is limited to just 10. Like all cards here the autograph is hard signed. This card is very nice looking, but I really wish the patch piece on the left was better. One color patches stand out like a sore thumb on these types of cards. That's all I really got in my box of Ultimate Collection. Upper Deck has really loaded up Ultimate Collection with a lot of things to find. Buying this stuff by the box really isn't going to get you a true taste of everything there is to have here. You'd have to go for cases and cases of the stuff! Giving an overall rating to products like Ultimate Collection is hard. If I had a lot of funds, I'd love to just sit down one day and break case after case of it and then oogle at all the amazing cards that came out. As it stands though, most collectors cannot even afford one box of it. Each box/pack is a whopping $250. You really have to have some deep pockets to dip into these cards. Collectors who cannot afford to open boxes can go the route of joining in on group breaks. The potential to win big is there, but also the really big possibility of just losing your money with nothing gained... not even a jersey card. It's easy to love the cards in Ultimate Collection, but it is a huge gamble and risk that is just too much for most collectors out there. As with all card brands in this stratospheric price range... I say just go for eBay or third party sites and buy singles. Single cards from these ultra high-priced products can go for a surprising low price. Not a bad looking product..but a bit pricey in my opinion..great review as always!! Overall, I think the Cup is the much more demanded big price tag product. With any of these big price tag one pack products its essentialy playing the lottery and hoping you win big though. Great looking cards and always love on card autographs. Honestly I think the cards look very plain but some are very nice looking, it's a bit of a pricier product! I'd much rather have the cup!! Great review as always!!! Always love seeing Tavares pulled! Yet another expensive UD product with little or no chance of getting your money's worth. Thanks again for another review! Nice break! 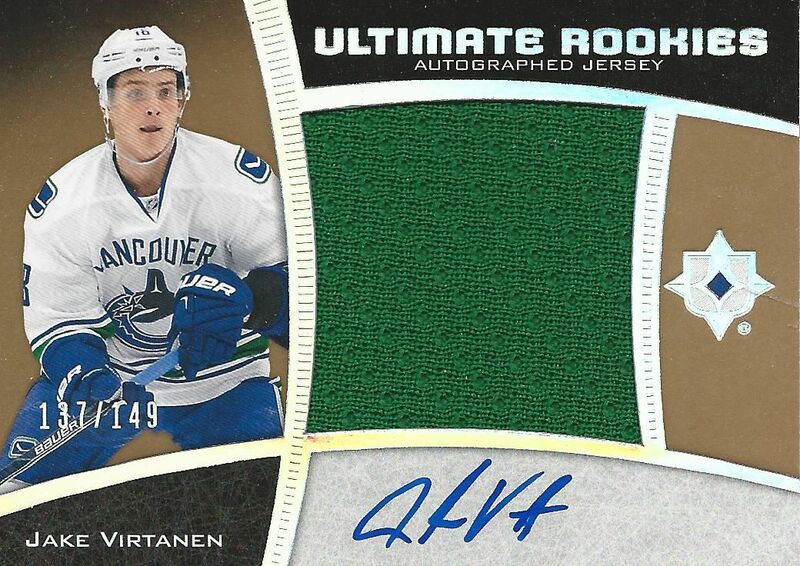 Nice jersey cards and I love that jake virtanen! Really love this product for the hits. Too bad its out of my price range. Great video as usual! The card design is simplistic but nice. U can sure tell its an upper deck design. I love this product. Recently got some nice hits from a break today! Premium product but the chance is also high for a really nice card! beautiful product but really expensive for the number of cards you get. It is a bit expensive but by the looks of the cards they are nice. Nice break as always. Would like to see more patches from Ultimate next year. Still great looking cards! Nice product overall,but found it a bit expensive for its value. It seemed very pricey for 1 pack with six cards but the cards are very nice. i like this product in general but it's just too expensive for the average collecter. nice product as always. but it's too expensive. Great box! A little bit pricy but I like the Nick Ritchie patch! Ouch, you win some you lose some. It's worth the gamble though sometimes. I thought the cards look a little bland and nothing unique about them. Not worth the money im my opinion. A bit pricey for 3 plain jerseys (numbered, but still...) Definitely a hit or miss product. Nice break! 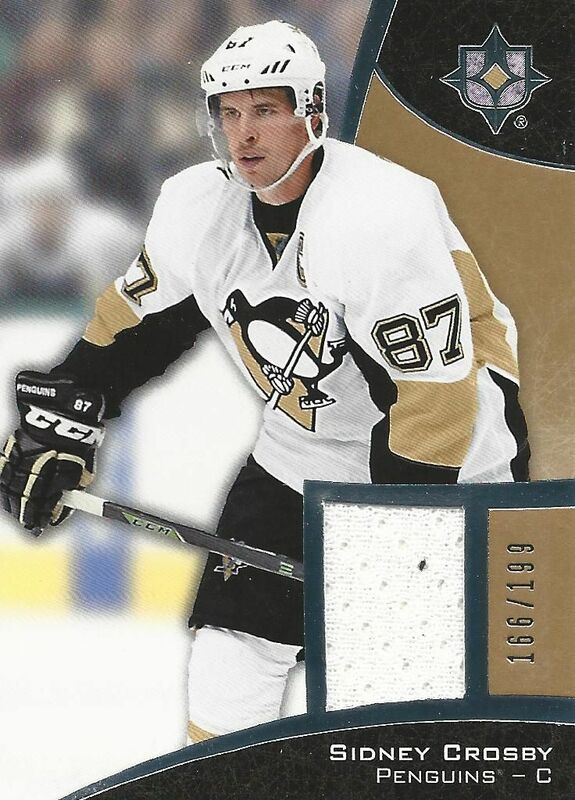 Nice Crosby and nice Patch /10. Very balanced and accurate review. One could say that Ultimate is a great example of "you get what you pay for." If you're all about the hits, here they are! Just hope you've got deep pockets . . .
Not a bad product! 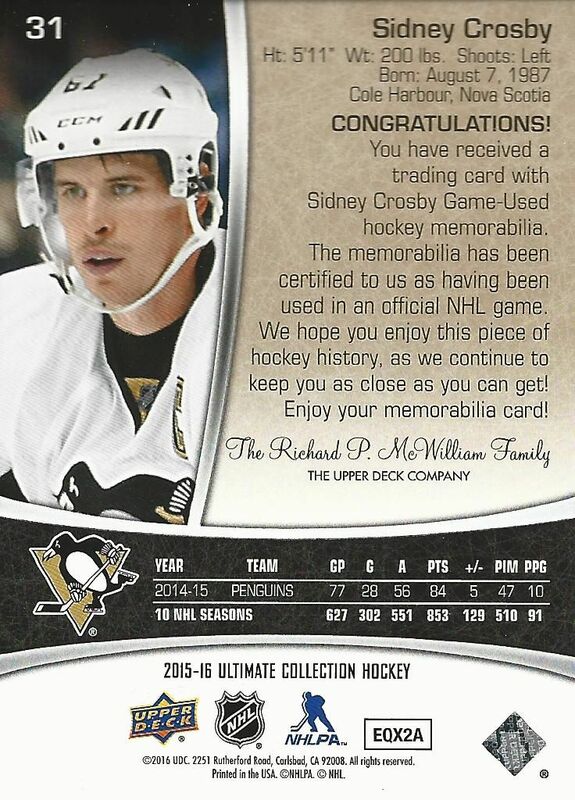 Nice Crosby jersey card. Great break! The Ritchie looks phenomenal (pardon the pun), despite the single-color patch. Too bad it's way out of my price range... I'd really like to get one of those. I think these cards are nice looking but it is too expensive. You would think they could package a $250 product more carefully so that the cards dont end up with chipping on the corners. I've watched a few different breaks and it seems rare to get a pack thats minty fresh all the way through. Also the sheer number of products seems to dilute the brand every year. Product is too pricey, but what can you expect from UD these days. Some of the cards seem too dull but pretty solid jersey relics that's for sure haha. Nice review and I think it's an expensive product but the cards look veYoutube nice.And Thanks for the giveaway. + There's definitely great cards to be pulled. 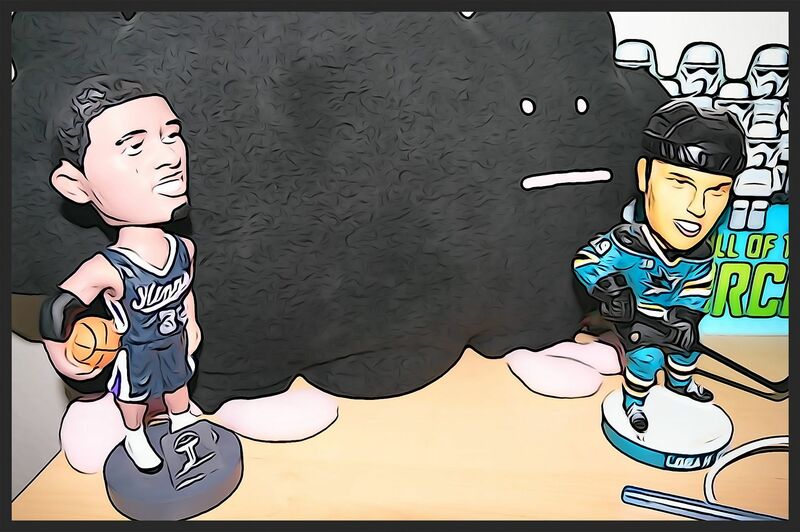 - The space for the autographs on the rookie cards is too small in my opinion. - Retro design is a cool concept, but not if that means that the players have two different rookie autos & jerseys in the same product. Maybe they could've made the retro cards as parallells numbered to 10 or something instead. One of the worst Ultimate years ever. Ugly cards, overpriced, one color jerseys, just not really anything good to say about it.